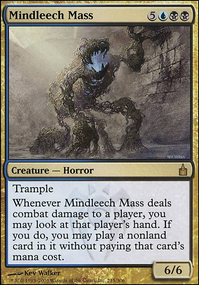 Whenever Wrexial, the Risen Deep deals combat damage to a player, you may cast target instant or sorcery card from that player's graveyard without paying its mana cost. 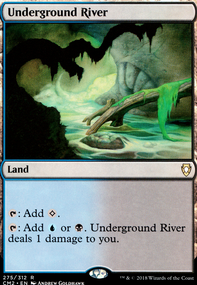 If that card would be put into a graveyard this turn, exile it instead. Smothering Tithe - A great 'pay to play' card, and you'll ramp like crazy if they don't. Rhystic Study - If they don't pay, you draw... they'll pay. Propaganda - Makes attacking you that much harder. Is a blue Ghostly Prison . Thief of Sanity - Thievery + some mill, all in a nice evasion package. 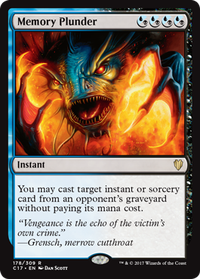 Mnemonic Betrayal - This is just too good, cherry pick all your opponent's best spells they've played. Desertion - Counter the threat, get the threat. Paradox Haze - Double up on your commander's ability. Emergency Powers - Great for resetting what is in someone's hand or your own. Addendum is gravy on top if you have nothing else to play during your main. Supreme Verdict - Just a great wrath spell. Render Silent - This card is just mean... Counterspell + Silence . Rewind - Counter and keep the mana open. Unwind - Sure it only works for noncreature spells, but there will be plenty of those around. Wrath of God - The original. Celestial Dawn - Makes casting opponent's spells with your commander just too easy. Cascading Cataracts - Indestructible color fixing. Revel in Riches - Mana fixing + a win-con if you get lucky. Lightning Greaves - Protect what matters most. Swiftfoot Boots - More protection. Sun Titan - This guy is a beast, sometimes he'll only do a small bit, other times he's your golden boy. Cool little combo: Use Mirage Mirror to copy a sacrifice artifact like Mindslaver , use the sacrifice of the copied card, then bring Mirage Mirror back with the titan. Paradox Engine - Use artifacts to pay for spells, then untap them to pay for more. Darksteel Forge - With all your artifacts you're running, this lets you play your wraths without any fear. Blood Baron of Vizkopa - It's good, but won't be active all that much as a 10/10. Merieke Ri Berit - Without a way to abuse untapping her she can under perform. Nightveil Predator - Doesn't do as much for you as it could. Odric, Lunarch Marshal - You're not strictly a combat deck. Spell Queller - I like this card, but in commander it's just too fragile. Traxos, Scourge of Kroog - He's not horrid. Walking Ballista - Just not got for this deck. 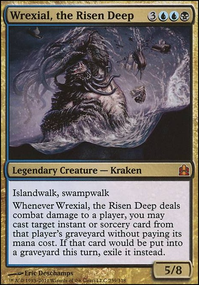 Wrexial, the Risen Deep - Too slow, by this point you should be focusing on control with your commander. Displacement Wave - You're putting in better. Mind's Desire - You're just not build for this card. Illusory Gains - Really depends on your play group. Dimir Locket - The signet is better. Thada Adel, Acquisitor is great at stealing other people's Sol Rings, amongst other potentially desirable artifacts. 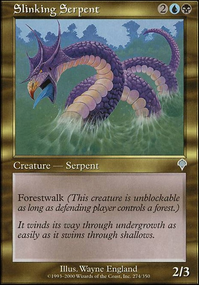 Wrexial, the Risen Deep is basically unblockable with Intimidate, Islandwalk, and Swampwalk. Fireshrieker allows you to double up on a creature's combat damage trigger, and it can be tutored by Deadeye Quartermaster , who can also help you grab any of the equipment cards in your deck. Another good equipment to consider is Bloodforged Battle-Axe . 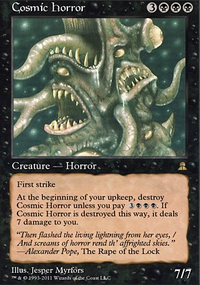 Other cool cards include Lord of the Void , Sphinx Ambassador , and Drana, Liberator of Malakir . 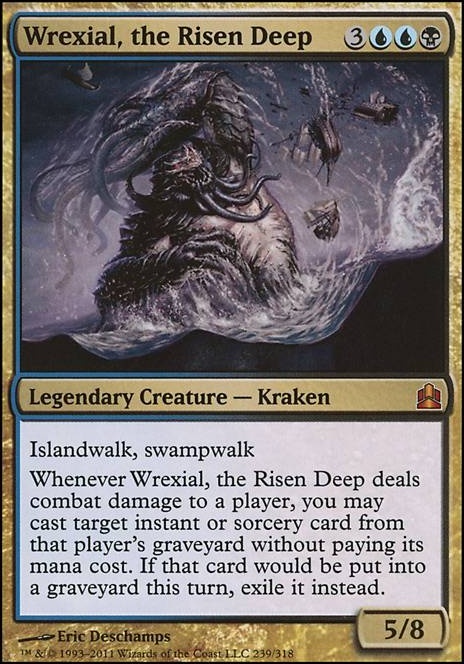 @ DiverDown I think Wrexial, the Risen Deep is definitely fun. I have a good friend of mine playing with him and he is damn fun to play with. Optimized and tuned he scales down to the power level of the people you play with. 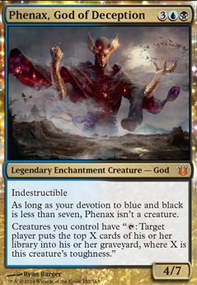 I would highly consider playing with him as dimir has so much cool cards in it's combination. I am particularly a fan of Shadow of Doubt especially. @ _Delta_ Thank you very much for the upvote! Yeah I am super proud of my Tuvasa page, even more than my baby Teneb page. The color scheme, music, and name for Tuvasa the Sunlit matches perfectly! Feel free to take your time with the feedback I been having so much fun playing with her! @ DrkNinja I also agree with you buddy, I am also an upvote whore, so whenever I get the chance I will upvote someones deck here when posted as well as give feedback if I can provide an adequate one, I usually don't provide feedback if it's not within my area of knowledge. Okay, as some of you probably know that I recently went all out on building a rather competitive Tasigur list and I have been having a lot of fun with it. However, I think I want to bounce some ideas off of you guys because I would like to tone the power level of my next deck that I construct down quite a bit. I primarily play at a club on campus, and I can see how new players who we introduce to the game may not like playing against my Tasigur list at all. 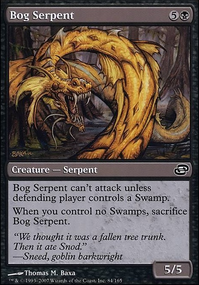 I sort of want to make a rather customized deck that focuses on flavor wins more than competitive elements and lines. 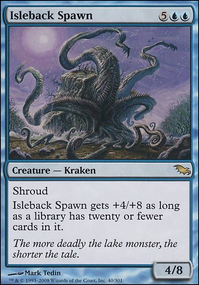 For example, Wrexial, the Risen Deep appeals to me because I have an affinity to Dimir colors and I think the card is flavorful considering that I can make as many Cthulu references and bad puns as I want. I just have no idea how I would build it, nor do I know how I would go about upgrading it to the competitive level eventually if I decide to go all-in on it one day. TL;DR How do I play casually? What would be a fun and flavorful commander that I can bring to the table? Please bombard me with suggestions. 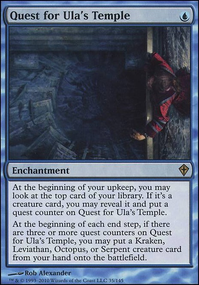 I have a huge preference toward blue, Dimir, Esper, and Sultai. Budget restraints aren't a huge problem either. Some recommendation if your going the mill route. Mindcrank and Duskmantle Guildmage is a infinite combo. Even if you're all into mill, some board wipes like Black Sun's Zenith or Killing Wave can really save you. 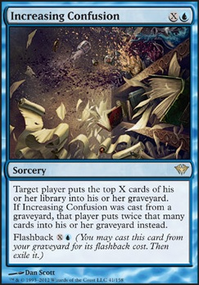 You want a deck that will remove the opponents deck while it controls what they’re doing and steadily building a zombie swarm? 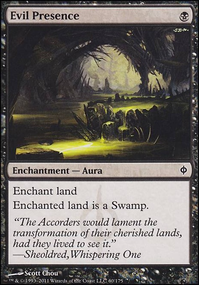 Urgoros, the Empty One seems to do a useful thing, and there are a lot of specters from Blizzard Specter and Blazing Specter to Sedraxis Specter, Liliana's Specter and Hypnotic Specter. 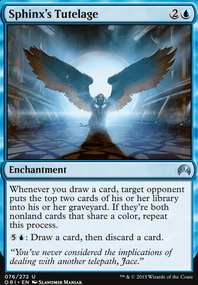 Then you can play planeswalkers like Liliana, Death's Majesty to reanimate stuff repeatedly and the one Bolas does it too. 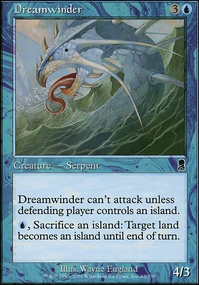 Wrexial, the Risen Deep, Sepulchral Primordial and Diluvian Primordial are all good, and even Molten Primordial can be if you have a way to sacrifice the stuff you steal like Grimgrin, Corpse-Born, Ghoulcaller Gisa, Carrion Feeder or Corpse Harvester.